Some time ago I came across these maps of US rivers systems depicted as subway routes. They’re nice illustrations of rivers as a connected system of transport corridors, with populated areas as stops along the way. Instead of viewing a map with blue lines in the background and cities brought to the fore, the roles are reversed. They combine hydrology with graphic artistry. 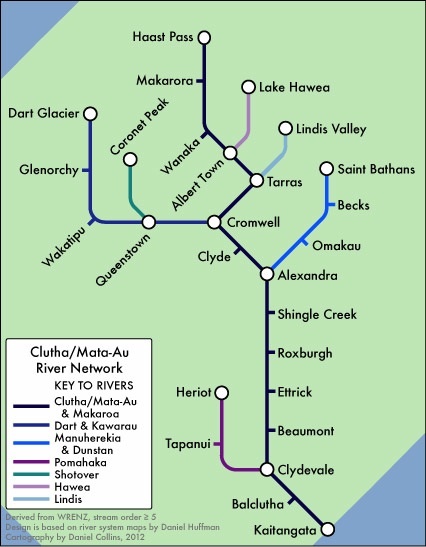 Now I’ve concocted my own version of these maps using the Clutha River/Mata-Au. This is New Zealand’s 2nd longest river, after the Waikato, but the largest by flow at the coast. The topology of the ‘transport’ network pictured is largely the same as the real river network, with only the larger rivers depicted. I used some artistic license in choosing which rivers to include and how faithfully to follow the rivers’ courses. Population centers and geographical features along the way are represented as stops. Each longitudinal river system is coloured the same, representing specific subway or train lines; the darker they are, typically the greater the flow. But rivers don’t just move water. They also move eroded rock or sediment, nutrients, pollution, and fish. In the case of fish, this movement is two-way. About 50% of New Zealand’s native fish are diadromous, meaning they migrate between river and sea. How much of this stuff moves along the rivers depends a lot on the flow. Where there is abundant sediment, its movement downstream is roughly proportional to the river’s flow rate to the power of an exponent greater than one (i.e., Qsediment ~ Qwaterb, where b > 1), which means that the conveyance of sediment down rivers mainly occurs during high flows and floods. The same applies to phosphorus, which typically binds to soil particles to get anywhere. Nitrogen, on the other hand, is more readily dissolved and doesn’t need high flows so much. If all flow stops, so does the transport system; no sediment downstream and no migrating fish. (In fact, not many fish at all, unless they burrow into the ground or climb over to more hospitable locations.) In a way, this all means that the train timetables differ from passenger to passenger, but at least for the Clutha basin you can expect trains to be running non-stop. If people ask nicely, I’ll make a similar map for the Waikato, but with New Zealand’s size, shape and population distribution there aren’t many options for good system maps. Iâ€™d love to see a map in this style of the river/lake/inland sea/canal routes in greater Europe + Russia, etc. I’d love to make a tee-shirt with a variation of this using whitewater kayak-specific stations. Would that be ok? What software did you use?